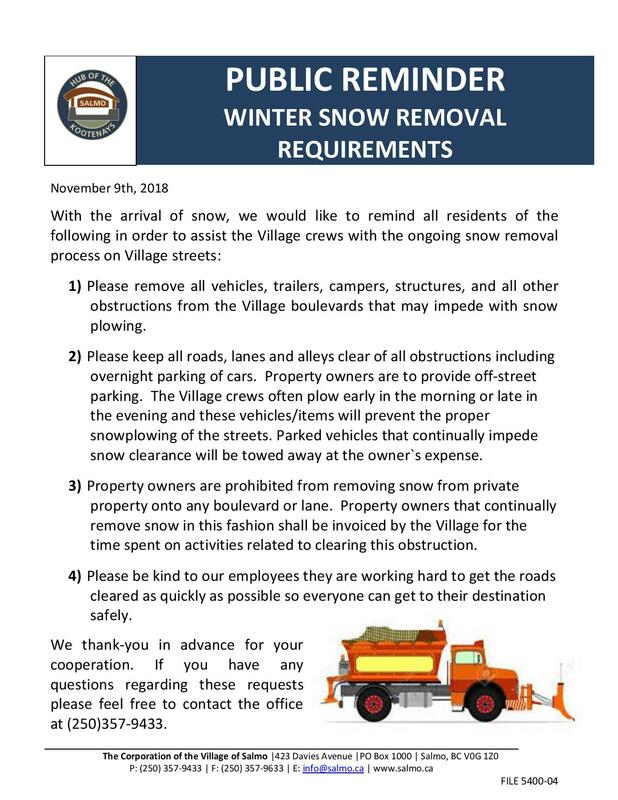 Please remove all vehicles, trailers, campers, structures, and all other obstructions from the Village boulevards that may impede with snow plowing. Please keep all roads, lanes and alleys clear of all obstructions including overnight parking of cars. Property owners are to provide off-street parking. The Village crews often plow early in the morning or late in the evening and these vehicles/items will prevent the proper snowplowing of the streets. Parked vehicles that continually impede snow clearance will be towed away at the owner`s expense. Property owners are prohibited from removing snow from private property onto any boulevard or lane. Property owners that continually remove snow in this fashion shall be invoiced by the Village for the time spent on activities related to clearing this obstruction. Please be kind to our employees they are working hard to get the roads cleared as quickly as possible so everyone can get to their destination safely. We thank-you in advance for your cooperation. If you have any questions regarding these requests please feel free to contact the office at (250)357-9433.